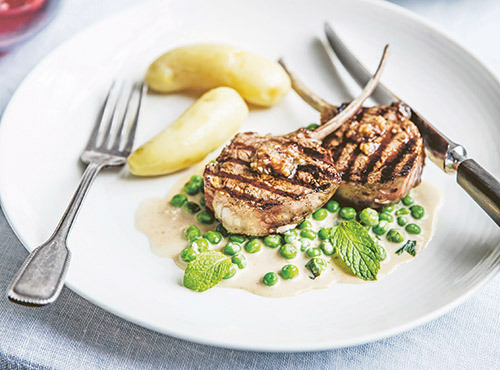 Lamb cutlets are a favourite choice for a speedy evening meal. Often I do little more than grill them and assemble a green salad, but I am prepared to go to a bit more trouble when it is early spring and the cutlets are particularly sweet. The anchovies in this sauce should be good-quality ones. Do not use remnants at the bottom of a jar of nameless oil that you have had for months. Preheat the oven to 110°C and put 4 ovenproof dinner plates inside to keep warm, plus an extra one for the cutlets to rest on before serving and a dish for the potatoes. Put the potatoes into a saucepan of lightly salted water and bring to the boil. Reduce the heat to low and cook until the potatoes are tender when tested with a fine skewer. Drain the potatoes and peel, then tip back into the hot pan and drizzle with a little olive oil. Tip into the warmed dish and keep warm in the oven until needed. To make the anchovy paste for the peas, crush the garlic to a paste with a tiny pinch of salt and mix with the anchovy and sugar. Cook in a small heavy-based frying pan over medium heat, stirring until the anchovy has almost melted. Add the butter and stir to form a smooth sauce. Set the sauce aside at this point. Bring a small saucepan of water to the boil. Cook the peas for 3 minutes or until tender. Refresh the peas quickly under cold water, reserving 1 tablespoon of the cooking water. Drain and reserve. Brush the cutlets with the olive oil. Heat a ridged chargrill pan or barbecue grill plate over high heat and sear the cutlets for 2 minutes on each side. Place a teaspoon of the anchovy paste on top of each cutlet and transfer to one of the warm plates in the oven to rest while you finish the sauce. Add the cream, mint and peas to the remainder of the anchovy paste and heat over low heat, stirring. If the sauce is too thick, add a spoonful of the reserved pea cooking water; the peas should just be very lightly coated and still look bright green. Generously spoon the anchovy and pea mixture evenly onto the warmed plates and place 2 cutlets on each one. Add the potatoes and garnish with a few mint leaves, if desired. Serve with a green salad alongside.